Kumbolo Lake Camping, Mt Bromo Tour Package 3 Days is one of the nature tourism provided for visitors who prefer like to explore the beauty for nature under Bromo Semeru National Park. Kumbolo Lake is a part of Mount Semeru hiking package that normally enjoyed by visitors after reach finish from Semeru volcano peak. Before you enjoy Kumbolo Camping, Mount Bromo Tour 3 Days, do not forget to bring completed mountain clothes because the temperature on both of Kumbolo and Mt Bromo peak is around 03 - 05 degree centigrade. Arrive in Kumbolo Lake Camping, Stay 1 night in the tents while enjoy the beauty of lake (At night, You can take photo for Milky Way and twinkles such as Mount Bromo Milky Way. 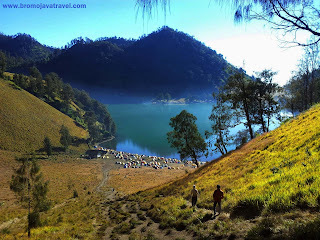 05.20 AM, Enjoy Kumbolo Lake Sunrise and views until finish at 08:00 AM (in this time, You will have opportunity to admire the beauty of Sunrise on Kumbolo as though appears from the lake) supported with fresh temperature and clear views. Finish enjoy Kumbolo Lake comeback to Pane Lake and continue to Hotel around Mt Bromo for 3 hours using private Jeep 4 WD through Savvannah Bromo (the most popular Savvana in East Java, Indonesia), Continue to Whispering Sand then heading to your hotel for 20 minutes. Arrive in your Hotel or Homestay, Stay 1 night. 02.30 AM, Wake you up for preparing, take You to Pananjakan for 30 minutes using Private Jeep 4 WD. Reach the parking lot, Do trekking for 10 minutes to view point, then waiting for Sunrise appearance at 05.20 AM. Enjoy Mount Bromo Sunrise Tour and other views from highest peak such as the view of Sea of Sand, Mt Batok, Crater until finish at 06.30 AM. Comeback to your jeep then continue to the Crater by stop at Sea of Sand for 30 minutes. Arrive in Jeep Parking, Do Mount Bromo Trekking for 30 minutes to Crater or You can rent the horse for 15 minutes. Enjoy the Crater views until finish, Comeback to your Jeep and return to hotel for breakfast, taking shower, relax enoughly and Check Out. Finish enjoy the trip 3 days 2 nights Kumbolo Camping, Mount Bromo. If You still have more time in your trip, You can included your vacation with other popular vaolcano or nature tourism around East Java, such as Ijen Crater, Rafting or many more. Detail information about Mount Bromo tour price and facilities, You can visit Our Contact.